Have you ever searched for that perfect project for car trips? Or carpools lines or waits at doctors' offices? And wouldn't be great if it was also a project that made great use of scraps? This is Bejeweled and, at 72" x 102", she is all those things. (Fabrics are from Modern Whimsy, by Laurie Wishburn for Robert Kaufman.) I really designed her to be a great-looking bed quilt, but you can easily change her size by adding more columns. The pieced columns of this quilt are made from either a 10" square (layer cake) or 2-1/2" roll-up, so it is a really versatile pattern. Ohhhh - if you had collections of coordinating scraps from your favorite designer's collections this would be great. 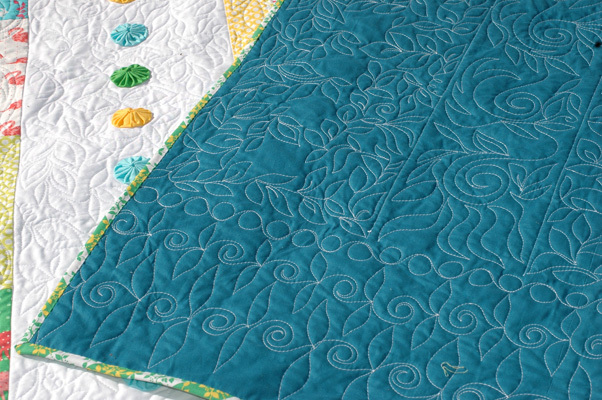 My mouth waters when I look at Deborah Norris' quilting. I could not accomplish it, but don't need to because I know someone who can. 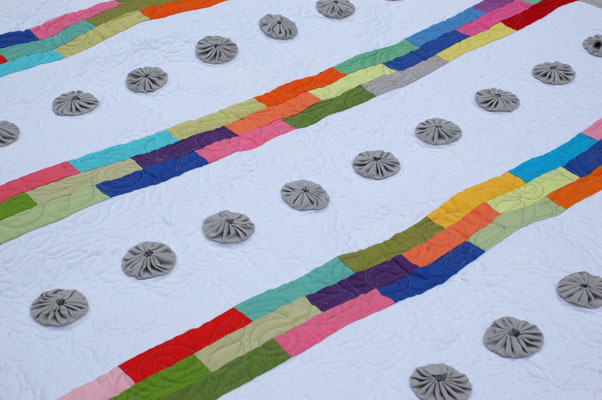 Even better, directions are included for a lap-sized quilt using pieced strips cut from a charm pack. Here is one made from a Kona Brights charm pack with yo-yos and borders in Kona Ash. 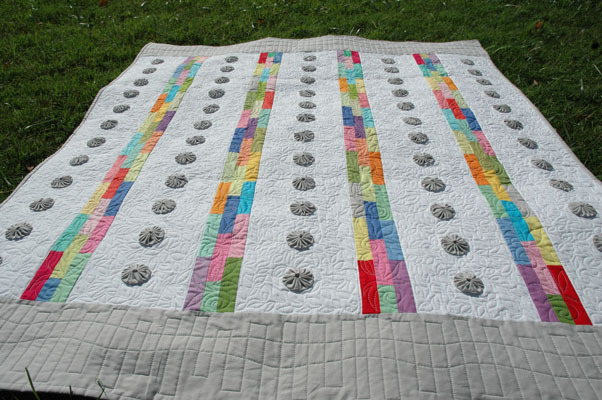 This quilt makes me so happy! I just love those yo yos! It would totally be worth the carpel tunnel to make this quilt! You sure do keep the hits coming, Amanda! love this quilt! :) another hit! 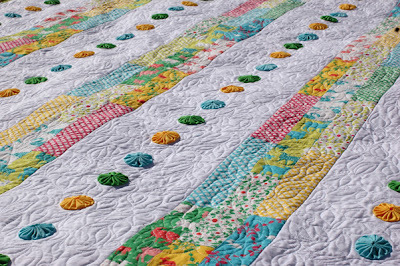 This is gorgeous and the yo-yos are very cute on it.Thanks for sharing your pattern!!. This will be in my to do. 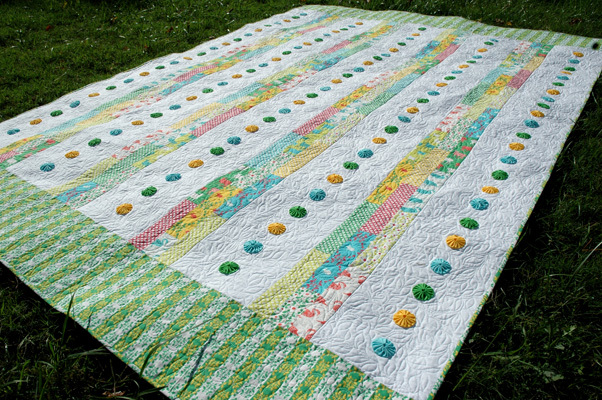 A really beautiful quilt. It doesn't look like it would be that hard either. You have such a good eye for color. This is a wonderful pattern. Lots of possibilities here! 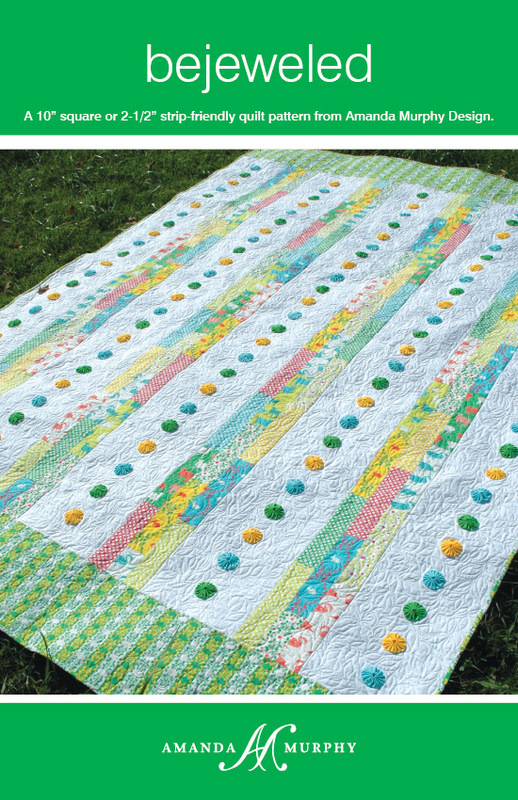 This is a fun quilt! I like it with prints and maybe even a little bit more with solids! Hard to decide. You have a lot of great new patterns. Too stinkin' cute! I had a friend in college who crocheted me a "yo" - it only went down, not back up, so it only qualified as a yo, not a yo-yo, according to her. Very pretty! I really like those yo yo makers. So very cute! Another one added to the list....and I love the idea of using the scraps from different collections, I have a few of those! You've hit another right out of the ball park! Beautiful! I would love to make this one in scrappy fashion! I'm off to check out your yoyo tip! You've got another winner! This would be great for kids and teens, but I like it too! Oh my! GORGEOUS! I LOVE this. And yes, the quilting is amazing. Wow. I adore the Bejeweled Pattern! It is so HAPPY and carefree!! I love the yo-yo's too! 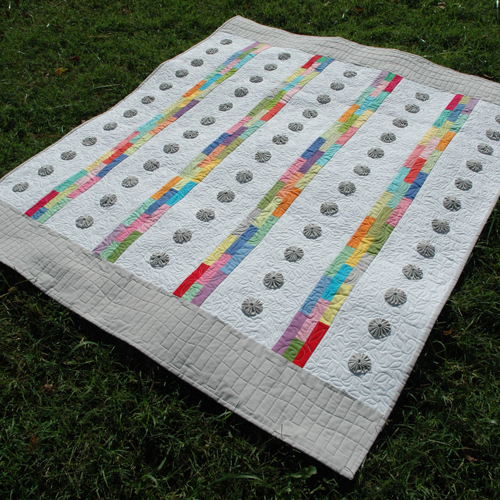 Such a fun quilt!